Yes, that’s really Kanye West, as unofficially confirmed by eavesdropping on airline staff, sitting about three feet away from me as I flew to Milan to take part (as a guest of Jaguar) in the Mille Miglia. 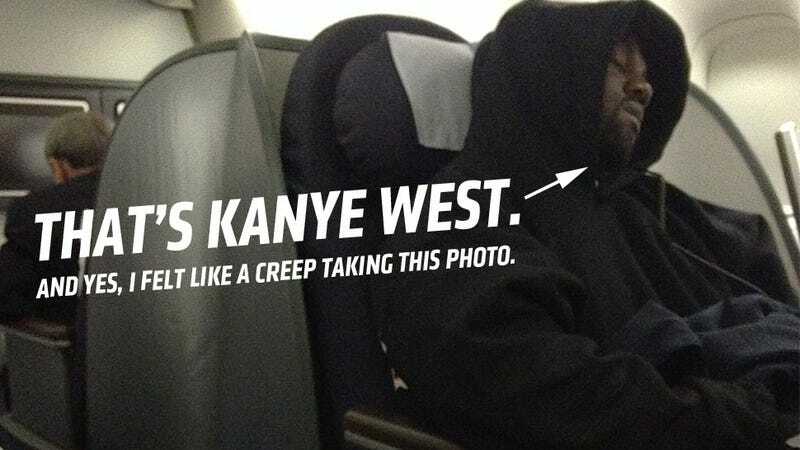 I have no idea what Mr.West is doing here, but if you’re curious, here’s what he’s like to travel next to. It’s as sublime as you’re guessing. Kanye was attired sensibly and clandestinely in a dark pull-over hoodie and very very white sneakers. Even though he was sitting in the somewhat lesser business class and not real First Class, he was still given somewhat enhanced treatment by the staff, which mostly involved bring him his food a bit before everyone else. • He’s a pretty quiet sleeper. Drool seemed minimal, as did sleep-sobbing. • He has a surprisingly battered-looking, black-painted MacBook. • I think he spent most of the flight watching the original Star Wars trilogy; I confirmed seeing Ewoks and Endor on the screen when I went to the bathroom. Yub nub, am I right? • The man seems to enjoy his cheese. I did, too — they had some sort of blue cheese that was fantastic. So, there you go. I wasn’t even in Italy yet and already exciting — though, admittedly, not exactly automotive-related — goings-on are going on. I’m beat, but I think scrutineering starts pretty soon. I already saw this out my hotel window, so I’m thinking today’s going to be great.